Any time you flex a spring you cause it to store energy. If you take a coil spring and compress it, you have put energy in. If you release the compression, the spring will straighten back out and give up the energy. It’s the same with the limbs on a bow. They are simply springs (cantilever springs). With a compound bow, the limb tips aren’t flexed backward toward the shooter by the string like they are with a traditional recurve that has no cams. Instead, the string and harnesses pull the limb tips toward each other. Here’s how a compound bow works. 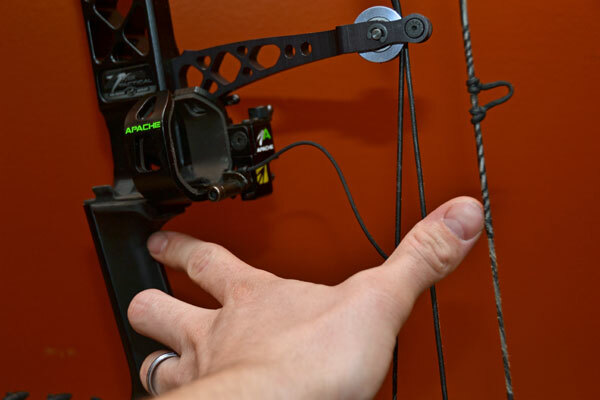 Compound bow eccentrics are simply a system of levers designed to give you a mechanical advantage when storing energy in the bow during the draw cycle. The basic eccentric system on a compound is made up of a string, one or two eccentrics (or cams) and one or two harnesses or cables. (A modern single-cam uses only one cam and a power cable.) With a traditional two-cam bow, one end of the harness attaches to a peg on the cam. The other end is attached to the axle on the opposite limb tip. When you draw the string, you pull the eccentrics around and that wraps the harnesses up and pulls the limb tips toward each other. Two-cam bows have two harnesses that work together to flex the limbs. Single-cam bows, on the other hand, have only one harness that is used to pull the limb tips toward each other. When you draw the string, the cam turns and does two things at once. It lets the string out on the front and back while at the same time wrapping up the power cable to flex the limbs. The result is the same, the limb tips bend toward each other and the bow stores energy. 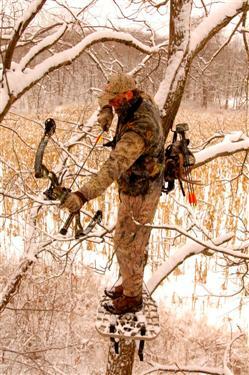 Most bowhunters in cold tree stand settings prefer a bow with a medium soft feel during the draw. This is because speed is generally less important at the typical whitetail hunting distances than when hunting open country plains game. The shape of the cam determines how the draw feels and also determines how much energy the bow stores. Bow engineers tweak the shape to make the do what they want it to. They can make it faster by causing the draw force to come up quickly as soon as you start pulling on the string remain high before dropping off into the let-off valley. That bow will store a lot of energy and has the potential to be faster than a bow that comes up to maximum draw weight more smoothly and slowly. An eccentric cam is just a convenient way to package two levers – a teeter-totter, if you will. One arm of the teeter-totter extends from the harness to the axle and the other extends beyond that from the axle out to the string. In a sense, the teeter-totter has two unequal weight children moving in toward the pivot and back out toward the end to gain an advantage on each other to make it pivot. You can see this for yourself by watching the eccentrics while pulling back on the string. At first, the string will be close to the axle and then will move away. The harness will start away from the axle and then come in close. You get “let-off” when the harness is right next to the axle. The string now has maximum leverage. The small child is then sitting at the end of the teeter-totter while balancing a much larger child sitting right next to the pivot point. Because of this mechanical advantage, you don’t need to pull very hard to keep the stiff limbs flexed at full draw and storing lots of energy. Some bows have a hard back-wall in the let-off valley while others are softer. The feel of the back wall is related to the shape of the harness track in the area of let-off. This, again, is the area the harness contacts when it comes closest to the axle at the end of the draw. If the track is flat and long here, the cam can’t rotate any farther – the harness pretty much locks it from turning farther. The back wall will be very solid. If the track is rounded in this area, you can easily pull the cam a bit farther. The back wall will be soft and mushy. Bow designers also produce a solid back wall by using drop stops. These small pegs or modules attach to the cam and either contact the limb at full draw to stop the draw or they come around and contact the harness to stop the cam rotation. Either way, these draw stops represent a mechanical method of stopping the draw cold. A solid back wall at full draw has a number of advantages that will improve your consistency when shooting. Make sure that any bow you buy as a solid wall. Regardless of how the solid wall is created, you definitely want a bow that has this feature. A solid wall produces a consistent draw length. When aiming at full draw you need something concrete and unchanging that you can pull against. Arrow speed is measured using a standard method so that we can get an apples-to-apples comparison. The most popular current standard is what is referred to as IBO speed. This is the recorded speed when shooting a 350-grain arrow from a 70-pound bow with a 30-inch draw length through a certified chronograph. IBO speed is not the actual speed you can expect to shoot the bow unless you have those exact specifications, but it does permit us a standard for comparison. A fast bow is one that has an IBO speed over 320 fps. Typically, most hunting models have IBO speeds over 300 fps. Arrow speed depends upon three factors: the design of the cam, the distance from the string to the back of the grip with the bow undrawn (this is called brace height) and the bow’s efficiency. Cam shape: As I mentioned earlier, designers can set up the lever arms in the cams any way they want. They can design the cam so that it causes the bow to store a lot of energy. Or, they can design the levers so the draw is softer and smoother and more comfortable. High-energy bows always feel like they draw harder than bows that store less energy, even though the peak draw weights are the same on both. The more energy stored, the harder the bow feels and the faster it shoots, all other things being equal. Brace height: The shorter the brace height (again, the distance from the back of the grip to the string) the greater the potential for speed. When the bow has a short brace height, you must draw the string farther to reach the same draw length. Potential energy (the fancy name for stored energy) is defined as force times distance; so anytime you increase the distance of the pull you increase the energy that the bow stores. Generally speaking, bows with shorter brace heights tend to be faster and produce more energy than bows with longer brace heights. Many bowhunters have come to consider a 7 inch brace height the “sweet spot” for their bowhunting needs. Bows with a brace height of less than 7 inches, while often times faster, can prove more difficult to shoot for some archers due to their unforgiving nature. Brace height is the distance from the string to the back of the grip when the bow is in its undrawn position. The shorter this distance, the more energy the bow will store for any given draw length. However, there is a tradeoff. A short brace height typically makes the bow slightly less forgiving. The bow shown above, the Mathews z7 Xtreme, has a brace height of 7 3/8″ while still producing speeds up to 330 feet per second. Efficiency: Efficiency is the ability of the bow to give back the energy that you put into it. It is actually a comparison of energy: divide the amount of kinetic energy in the arrow as it leaves the bow by the amount of stored energy in the limbs at full draw. This ratio will always be less than one. The lost energy is due to friction in the eccentrics, cable guard slide/harness system and any kinetic energy contained in the limbs and string and harnesses after the arrow is gone. This leftover energy, by the way, creates vibration that causes bow noise. The most efficient bows on the market today have efficiency ratings in the range of 80% to 85%. The more efficient the bow, the faster it will be for the same amount of effort from you. Obviously, a bow with high efficiency is good. Efficiency drops off as you increase draw weight or decrease arrow weight. That’s why a lighter arrow doesn’t penetrate quite as well as a heavier arrow – the light arrow has soaked up less of the bow’s energy on release and there is more energy left behind for the bow to dissipate through vibration – that creates noise. The lighter arrow produces a noisier shot. Prior to the mid-1990s, there was only one cam style on the market: dual cams. Around 1995, Mathews Archery introduced the single-cam and shortly thereafter Darton Archery introduced the first hybrid cam. Today there are four basic cam styles on the market: two-cam, single-cam, hybrid cam and a combination of the two-cam and hybrid called the modified hybrid cam or binary cam. I’ll tell you a little about each style and some of their tradeoffs. Two-cam systems: Two-cam bows became a problem when their designs started to become aggressive. When that happened, the cams became very sensitive to synchronization problems. In other words, if one harness was made a tiny bit longer than the other or stretched slightly more after assembly, the cams didn’t turn over at the same time and this resulted in poor arrow flight – a tail-high or tail-low arrow flight that was impossible to eliminate by moving the rest and nocking point. If you checked your timing every couple of days and kept a bow press handy, you could keep these high-performance two-cam bows working fine, but you had to really watch them closely. One hot day in the back seat of the car and the synthetics making up the string and harnesses cooked. The wax between the fibers melted out and everything stretched. I remember arriving at a Colorado elk camp after driving 22 hours in my old Cherokee. Both of my bows were in a black hard case in the back of the Jeep and the sun beat on them for many hours. When I pulled the bows out in camp, I was shocked. The cam timing was a mile off on both bows. Fortunately, I had a bow press with me, but that was the reality of the day. Those fast, high let-off two-cam bows were a handful to keep shooting well. How the bow feels when you draw it, and the kind of back wall it possesses are both functions of the cam design. By the way, modern synthetics are sufficiently improved and stretch-proof that some bow manufacturers are once again making aggressive two-cam bows and this time around they work much better. Most archers didn’t want to be bothered with a bow that could go out of synchronization at any time, but they still wanted to shoot a fast arrow. That is why the single-cam style entered the market and became so popular – it solved this problem. Single-cam system: The top limb of a single-cam bow carries an idler wheel and the bottom limb carries the cam. The idler wheel provides no mechanical advantage; it is simply there to unroll the string as you draw the bow. The bottom cam does two things, it takes up the control cable as you draw the string (this is what flexes the limb tips toward each other) while at the same time letting out the other end of the string at the correct rate to keep the nock traveling straight back and straight forward. The single-cam is not sensitive to changes in power cable length. If the power cable stretches a little, the bow remains in tune because there is only one cam. Hybrid cam systems: You can think of hybrid cams as a mix of single-cam and two-cam technology. They do about the same thing as a single-cam bow. In other words, because the top cam is attached directly to the bottom cam (the top cam is called the slave and the bottom cam is called the master) these systems are less sensitive to power cable stretch. When the power cable stretches, both cams move instead of just one as is the case of the two-cam bow. Therefore, hybrid cams are more reliable than two-cam bows because they are much less sensitive to timing issues. Hybrid cams are supposed to make it easier to attain a perfectly level nock travel back and forward. This is important for good arrow flight. Not all bows produce perfect nock travel. That means that some bows are easier to tune than others are and some can’t be tuned at all. I’ll dig into the important subject of nock travel in the next chapter. It is debatable whether the hybrid has any tuning advantages over a well-made single-cam. This system is certainly better than poorly made single-cams that I have shot. I have endured some amazingly bad arrow flight from single-cam bows whose cams were not properly designed for all draw lengths. I think if these poorly made single-cams had been effectively policed off the market by some licensing agreement, the hybrid never would have gained traction Instead, people began blaming all single-cams for the problems of only a few. Regardless of why it became popular, the hybrid is now a big part of the bow landscape. Most bow companies have some form of hybrid cam. Modified hybrid cam systems: Modified hybrids are the newest style on the market. Some companies call them binary cams. The top and bottom cams are mirror images of each other. Rather than the harness attaching to the opposite limb tip, it attaches to the opposite cam. In this way, the cams are slaved together just as they are with a standard hybrid cam, but the harness tracks and string payout tracks are identical on top and bottom making it very easy to produce level nock travel. The biggest difference between the hybrid and the modified hybrid cam is the fact that there is no set slave and master. It changes depending on the lengths of the harnesses. All that matters is the fact that the cams are linked together so they can’t change rotation independently and go out of time. To summarize, I don’t recommend a two-cam bow. There is not enough to gain from that design that it is worth the nagging problem of always having to check cam timing. Select a single-cam, a hybrid cam or a modified hybrid cam style. However, just to be on the safe side, don’t walk out of the archery shop until you know that the bow you have selected can be tuned. December 11, 2014 in Archery 101.